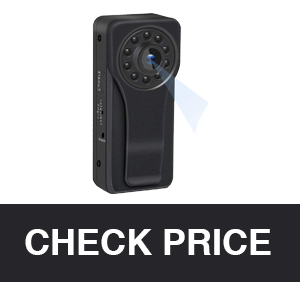 When it comes to buying hidden cameras, there are a whole lot of options. The market is saturated with wearable cameras. These may include a button spy camera, spy glasses, and other similar cameras. The point of a hidden body camera is that it should allow you to covertly record videos and take pictures of events and meetings that you attend. Body worn cameras are popular amongst the police. However, they can also be useful for civilians who want to record their activities. There are so many different options in terms of body cameras that the search can be pretty daunting for most people. 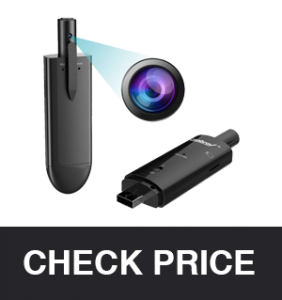 You have to take into consideration several factors such as the camera placement, the battery life, whether it has loop recording, the resolution, etc. However, we have made the search a whole lot easier for you. In this article, we’ll give you a deep dive overview of the 10 best hidden body cameras for sale in 2019. To compile this list, we have personally tested and vetted dozens of the best body cameras in the industry. We have also consulted surveillance experts regarding the best body worn cameras for civilians. In this article, we present to you all of our findings. The Veho Mini Handsfree Body Worn Camera is the Editor’s Pick for the best hidden body camera of 2019 for a number of reasons. It provides the clearest quality of video recordings amongst all the other body cameras and has a wide range of features that are useful when conducting high-profile stakeouts and surveillance. Veho itself is a well-reputed brand that’s used by law enforcement agencies and security professionals from around the world. As such, you can trust that this is the best of the best. Over the past couple of years, the Veho Mini Handsfree Body Worn Camera has become the most popular body camera in the world. It cam be attached to the body or mounted on top of a car or bike. This body camera has a 5 megapixel camera that can record videos up to 1080p in resolution at 30 frames per second. If you want an ultra-smooth experience, you can also record the videos at 720p at 60 frames per second. You have the option of 3x digital zoom as well, but only when you’re recording in 720p quality. You can control the recording remotely and even take snapshots while recording. It has an ultra-wide angle 170 degrees lens so that you can capture images from all around the camera and get an expansive view of the surroundings. You can trigger a Continuous Photo Mode so that pictures are taken every 2, 3, 5, 10, 20, 30 or 60 seconds. You can set up a 5 or 10 seconds of self-timer as well. Setting up date and time stamp is optional. Loop recording is enabled so newer videos can be written over older videos. As such, you don’t lose any valuable footage. You also have the option of triggering slow motion during playback. It comes with a 1400 mAh Lithium rechargeable battery that can record 4 hours of video. Has an internal 8Gb Micro SD card. 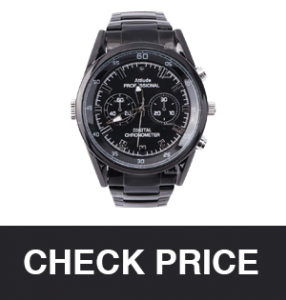 The 1.5” LCD display allows you to review videos immediately. You can use the Touch Screen to control the video settings and trigger features such as slow motion, playback, etc. After you’ve gone through the series of features it has, do you even really need to ask why this Veho Mini Handsfree Body Worn Camera is my number 1 choice? It’s my #1 choice because it’s the most powerful and advanced hidden body camera in the world! No other camera competes. It has a wide range of features both in terms of video and image recordings such as setting up continuous photo mode, loop recording, slow motion, etc. It also has the widest angle lens in the market so you capture a wide landscape, thus ensuring that you don’t miss any details. And the video quality is beyond reproach. I won’t say that this body camera is meant for everyone. It is quite expensive, not the most discreet (because of size), and not everyone will need all of its features. As such, if you’re looking for the world’s most advanced body camera, this is great. If not, then move on! Widest range of features amongst all the body cameras in the world. Used by professionals around the world so it’s reliable. The Ehomful Mini Spy Hidden Body Camera is our Budget Pick for the best personal body cameras in the market because it’s one of the cheapest. However, just because it’s cheap don’t think it’s not powerful. This little body camera looks just like an ordinary USB drive but it can record super sharp images at Full HD resolution. Despite its low cost, it manages to be one of the most advanced body cameras in this list, second only to the professional-grade Veho Mini Handsfree Body Worn Camera we mentioned earlier. This body camera can record Full HD 1080p videos at 30 frames per second. There are no distortions or blurs, and it performs really well even in low lighting. It has a 140 degrees wide-angle lens that can cover a wide landscape. Comes with a 550mAh rechargeable battery that can record videos continuously for up to 3 hours. Recharging it is extremely easy. 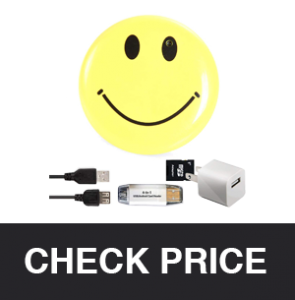 If you pull the top off, you’ll find a USB, simply plug it into your computer or laptop and start charging it! You can clip it on your coat, shirt, or bag. It weighs just 3 ounces so you won’t even feel it. And if someone sees it, they’ll think it’s just a USB drive. Some people even choose to wear it as an accessory around their necks. This is an extremely minimal spy body camera. It has a sliding function to turn it On or Off. And there’s one button on the top for recording or pausing. A single click is all it takes to start recording. The videos can be date and time stamped. This is an optional feature. Loop recording is possible. As such, if the SD card runs out of space, the new videos will be recorded over the old ones. 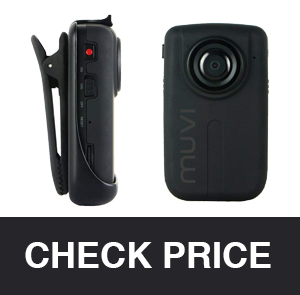 One of the most important aspects of a personal body camera is that it should be discreet. That doesn’t mean it has to necessarily be “hidden” per se. It can also be hidden in plain sight. And that’s exactly what Ehomful Mini Spy Hidden Body Camera offers. This body camera looks just like a USB so it can easily be hidden in plain sight. You can even pull the top off to reveal the USB drive. And now that everyone is always carrying a USB anyway, it’s not suspicious at all. As such, if you go to some meeting that you want to record, you can simply clip it on your bag or wear it around your neck and no one will be wiser. It’s also extremely cheap so just about anyone can buy it! Can easily be worn around the neck or clipped on to the bag or clothing. Looks just like a USB drive or a fashion accessory. The Fuvision Hidden Body-Worn Camera Recorder is one of the smallest and most discreet body cameras in the world. It’s so small that it can be pinched between your thumb and your index finger. However, it proves that size does not matter because it still packs quite a heavy punch. Even though it’s extremely cheap and small, it still has some surprisingly advanced features which earns it a #3 spot in our list of best hidden body cameras for sale in 2019. It can record videos in both 720p and 1080p resolutions at an optimal 30 frames per second. The camera has a 1/3″ CMOS 2.0 megapixels lens that ensures you get crisp and clear images without any blurring, blocking, or distortions. 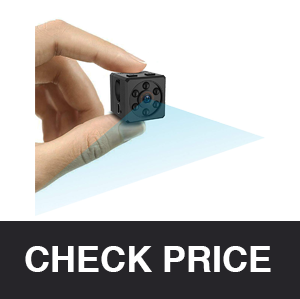 Videos are recorded with a 66 degrees lens which is not wide enough to be able to capture the whole room. As such, if you’re wearing it on you and you need to record the entire room, you’ll have to move around a lot. At a single charge, it can capture 90 minutes of 1080p video and 100 minutes of 720 video. Supports a maximum of 64GB micro SD card, but one isn’t included with the product. You have to buy it separately. Loop Recording is enabled so older videos will be overwritten when the SD card maxes out. Motion Detection is available. As such, if you enable that, the camera only starts recording whenever there’s action detected in the vicinity. This serves several functions. The camera only records when there’s something worth recording, and it saves battery efficiency and memory card space. You can clip it into your pocket using the front or rear clip. Or you can mount it on a wall with the camera mount bracket. If you like your body cameras to be small and discreet, then the Fuvision Hidden Body-Worn Camera Recorder is your best bet. It’s one of the smallest personal body cameras in the world, but it can still record a hell of a video. The only issue (and it’s a pretty big issue) is that it comes with a 66 degree lens, which is not nearly wide enough to capture the entire landscape. The Ruidla Mini Hidden Body Camera is another one of the best body cameras in the world. Honestly, this body camera could have just as easily been placed in number 2 or 3 in this list. It might not be the smallest or the most discreet body camera in the world, but it has a lot of great features. Can record videos in 1080p, 720p, 640p, or 480p resolutions with a 170 degree ultra wide-angle lens. Supports micro SD cards up to 128 GB. The Night Vision feature allows you to see clearly in the dark for up to 16 feet in a straight-line distance. You can enable motion detection so it automatically starts taking a video whenever there’s any movement. It also send 3 immediate snapshots to your phone app. It can record videos for up to 3 hours continuously. 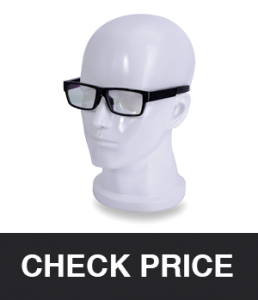 The ViView Hidden Wearable Camera Glasses is one of the most discreet body camera in this list. The camera is located in the bridge between the lens. It looks just like an ordinary pair of glasses so no one will suspect that they’re being recorded. Furthermore, because the camera is placed at an eye-level, it records videos at the optimum angle. You can trigger video recording with the click of a single button. So you just have to pretend like you’re adjusting your glasses and you can start recording. Can record 1080p videos with a 120 degree wide-angle lens. Supports 16GB micro SDHC card. The inbuilt rechargeable lithium ion battery can record up to 70 minutes of footage at a single charge. Supports 2-way audio so you can also communicate with a team member who is looking at the visuals in another camera. 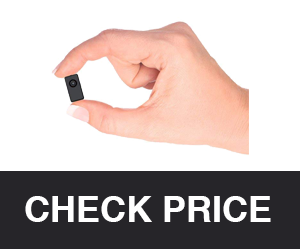 The CHUHE Mini Spy Body Camera is the cheapest and smallest body camera in the market. It looks like a thumb-sized magnetic black dice. It can be attached anywhere at all. You can use the magnetic field to attach it to a metallic button, your cufflinks, etc. You can even string it around your neck. It will seem like it’s just an accessory, but it will continue recording high quality videos. The 4pcs LED light provides Night Vision even when it’s completely dark. Has an inbuilt 180mah battery that can record 50 minutes of videos at a single charge. Motion Detection mode starts recording videos only when it detects motion, thus saving battery and storage space. Loop Video Recording can overwrite old videos in favor of new ones. 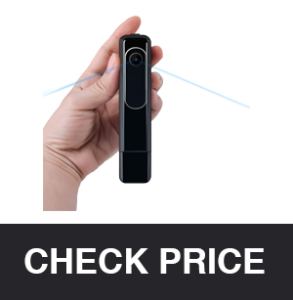 The Conbrov Hidden Camera Pen Mini Body Camera looks like a USB drive on one end and like a pen clicker on the other end. The camera lens exists on the pen clicker. As such, you’re supposed to clip the pen into your pocket so that the camera can capture everything around you. Because it looks just like a pen, it’s completely discreet and non-suspicious. Can record videos in 720p or 360p with a 75 degree wide-angle lens. Night Vision feature can capture videos even in dim lighting. The inbuilt 720mAh rechargeable battery can record 5 hours video in bright light and 2 hours with Night Vision. Supports a micro SD card of up to 32GB. The SpyCrushers Smiley Face Body Camera looks just like a smiley face badge that you can wear on your shirt. The camera lens is hidden inside one of the eyes so it’s completely discreet. It records videos in 720 x 480 resolution and pictures in 1280 x 960 resolution. As such, it’s not the clearest body camera in the market but it gets the job done. The internal battery is only enough to record up to 2 hours of videos in a single charge, however, it has a strong standby time of 120 hours. The biggest drawback of this body camera is that it can only be worn in extremely informal parties. 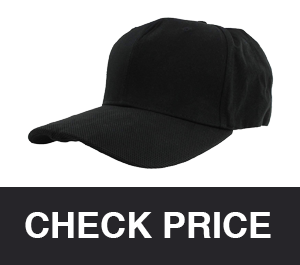 The RecorderGear Body Worn Camera Hat is a discreet personal body camera because it’s hidden in an ordinary-looking cap. It can record 1080p videos at 30 frames per second with a 60 degree lens. The lens is not wide angled so you would likely have to move around considerably so that you can capture your entire surrounding. It can record videos for up to 2 hours continuously at a single charge. The Miebul Smart Watch Camera is a body camera that’s hidden within a regular analog wrist watch. It records 1080p videos and stores them in an internal 16GB memory card. The memory card can accommodate 5 hours of footage, and after that the older ones get overwritten due to the Loop Recording feature. The internal battery can only record 90 minutes of footage at a single charge. The biggest drawback of this body camera is that it’s positioned on the wrist. As such, it won’t capture an ideal viewing angle. In order to capture videos at the right eye-level angle, you’ll have to keep your hands up closer to your shoulders. So now you know all about the best covert body cameras in the market. All of the cameras mentioned in this list have been thoroughly vetted and recommended after discussing with surveillance experts, so you can trust that they’ll do the job perfectly. However, it’s up to you to decide which one of these serves your interest best. If you have any other questions about hidden body cameras or how to select the right body camera, feel free to mention it down in the comments!